You will fall in love with Betty, whose loyalty and love are demonstrated through tremendous courage and sacrifice. Based on a true story, Betty must come face-to-face with the dreaded disease—small pox. Will she save herself? Betty faces myriad trials, including the death-grip of a terrifying blizzard, but the heart-warming love for her devoted servant trumps all. 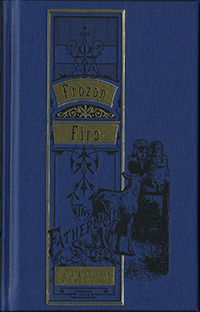 Frozen Fire will keep you on the edge of your seat and will cause you to contemplate the purpose and meaning of life. If you enjoyed the action-packed adventure of Teddy’s Button, you’ll be enthralled by the energy and drama of this provocative read for the entire family. From Brooke Kaczor of Oneill, Nebraska on 1/20/2016 . This story was well written and engaging. The characters of Betty and Tom are memorable as they face difficulties and much more. It is a great read for anyone in the family. Perfect for all ages, a lesson to be learned by all, if we will not forgive others their trespasses, our Heavenly Father will also not forgive your trespasses. What a wonderful blessing this has been to me. I will definitely want to read to my children. From Roger Bodenstab of Crescent City, California on 6/3/2013 . I could not put this book down! I was enthralled from the very beginning and I was challenged through the life of little Betty. This book helped me to understand what forgiveness really looks like in the face of difficult circumstances and has brought me closer my Heavenly Father. A must read for all ages! From Anonymous of Tacoma, Washington on 6/3/2013 . Frozen Fire kept my attention with mystery,drama and underlying faith in God no matter the circumstances. Tom was shown to be a brave and loyal servant, even when his mind was clouded. Betty learned how to be useful and helpful in strange circumstances.